Socrates (470-399 BC) was a classical Greek (Athenian) philosopher. Credited as one of the founders of Western philosophy, he is an enigmatic figure known chiefly through the accounts of later classical writers, especially the writings of his students Plato and Xenophon and the plays of his contemporary Aristophanes. 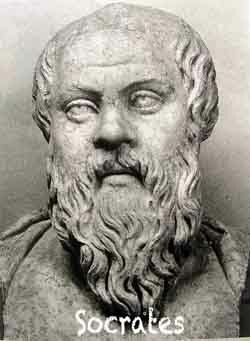 Many would claim that Plato's dialogues are the most comprehensive accounts of Socrates to survive from antiquity. Socratic problem -- Scholars and historians who try to gather accurate information about Socrates face a peculiar problem, known as the Socratic problem. These problems arise due to three key features - There is no proof that Socrates ever wrote anything, philosophical or biographical. Whatever information we derive about Socrates is from the works of four scholars namely - Xenophon, Plato, Aristotle, and Aristophanes. The writings are in an artistic and creative style, therefore creating doubt whether these details are truth or fiction. Therefore, the information on Socrates that is available can’t be proven and has no historical evidence. If the evidence is only through the writings of his associates, there is doubt that Socrates ever existed – it is possible that he was merely an imaginary character in his student’s writings to explain their philosophy. Details of the life of Socrates can be obtained from the writings of his associates and students, Plato, Aristophanes and Xenophon. There is no proof that Socrates himself wrote anything. Most of whatever we know of him is through Plato's works like 'The Apology'. Socrates was primarily known for his ideas, communication skills and public teachings. His views and ideas are reflected through his associates' works. In Plato's work, Socrates' father was Sophroniscus and his mother Phaenarete, was a midwife. Socrates married Xanthippe, who was much younger than him and he had three sons, Lamprocles, Sophroniscus and Menexenus. Very little is known on what Socrates did for a living. According to Timon, he took over the stonemasonry trade, which was a family business, although Xenophon's version suggests that he dedicated his life to philosophical discussion. Aristophanes' writings describe Socrates running a sophist school and getting paid for it. Xenophon and Plato disagree with this, saying that Socrates did not accept any payment for his teaching, with his poverty acting as proof of this fact. In Plato's dialogues he portrays Socrates as a soldier who served in the Athenian army and fought in the battles of Potidaea, Amphipolis, and Delium. The Socratic Method or elenchos is described in Plato's 'Socratic Dialogues'. The Socratic Method clarified the concepts of Good and Justice. If you have any problem, break it down into a series of questions and you will find your required answer in those responses. This philosophy earned him the crown of father of political and moral philosophy and a leader in mainstream Western philosophy. The Socratic Method is so designed as to help examine one's own beliefs and evaluate their worth. necessarily produce successful sons and that moral excellence was more a matter of divine bequest than parental upbringing. Socrates believed that wisdom was parallel to one's ignorance. One's deeds were a result of this level of intelligence and ignorance. He constantly connected the 'love of wisdom' with 'art of love'. It is debatable whether he believed that humans could become wise, but he drew a clear line between wisdom and ignorance. Socrates believed that one must concentrate more on self-development than on material things. He encouraged people to develop friendships and love amongst themselves. Humans possess certain basic philosophical or intellectual virtues and those virtues were the most valuable of all possessions. To act good and to be truly good from within are different and virtue relates to the goodness of the soul. "Ideals belong in a world that only the wise man can understand". He had no particular beliefs on politics but did object to democracy, and disliked its Athenian form. Basically, he objected to any government that did not run on the basis of his ideas of perfect governance. Socrates refused to enter politics because he could not tell other people how to lead their lives when he didn't know how to live his own. He thought he was a philosopher of truth, which he had not fully discovered. Towards the end of his life, democracy was supplanted by the Thirty Tyrants for approximately one year, before being restored. For Socrates, the Thirty Tyrants were no better (and arguably worse) rulers than the democracy they sought to replace. 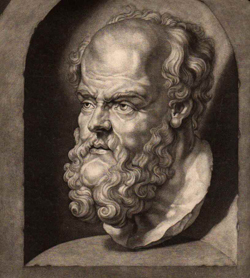 His caricature in Aristophanes' comedy The Clouds, as a clown, was supposed to be a more accurate representation of Socrates than that of his students' works, according to Kierkegaard. Socrates thought answering the laughter in a theatre was much more difficult than answering the challenges of his accusers. Socrates was also criticized in the writings of Callias, Eupolis and Telecleides. Plato and Xenophon were direct disciples of Socrates and wrote continuous descriptions of him. Aristotle refers frequently, but in passing, to Socrates in his writings. 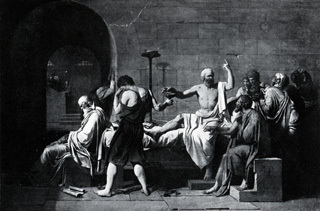 The Socratic Dialogues are conversations between Socrates and other people of his time or discussions between him and his followers. The beliefs of Socrates, as distinct from those of Plato, are difficult to discern. Little in the way of concrete evidence exists to demarcate the two. The lengthy presentation of ideas given in most of the dialogues may be deformed by Plato, and some scholars think Plato so adapted the Socratic style as to make the literary character and the philosopher himself impossible to distinguish. Others argue that he did have his own theories and beliefs, but there is much controversy over what these might have been, owing to the difficulty of separating Socrates from Plato and the difficulty of interpreting even the dramatic writings concerning Socrates. Consequently, distinguishing the philosophical beliefs of Socrates from those of Plato and Xenophon is not easy and it must be remembered that what is attributed to Socrates might more closely reflect the specific concerns of these thinkers. The matter is complicated because the historical Socrates seems to have been notorious for asking questions but not answering -- claiming to lack wisdom concerning the subjects about which he questioned others. The Apology is the actual defense speech delivered by Socrates during his death trial. In the Athenian jury system, an "apology" is composed of three parts: a speech, followed by a counter-assessment, then some final words. 'Apologia' in Greek means defense and not regretting anything.